During a workout we can all go from zero to hero and push hard but the safe way to train is to bring the body’s temperature up slowly and loosen up the muscles before we get to do anything serious. That’s what warm-ups are designed to do. Stretching, on the other hand, is done in order to improve overall flexibility. Once muscles have worked they are at their most compliant state and they let us stretch further than we normally would gaining more ground while we are at it. Timing: We start with a warmup and then we finish our training session with a cool-down and some stretching. Warmups are critical to a better performance and fewer injuries but stretching is somewhat of an optional extra - we can do it, we should do it but not doing it will not cause any issues, most times. It is highly recommended nonetheless. 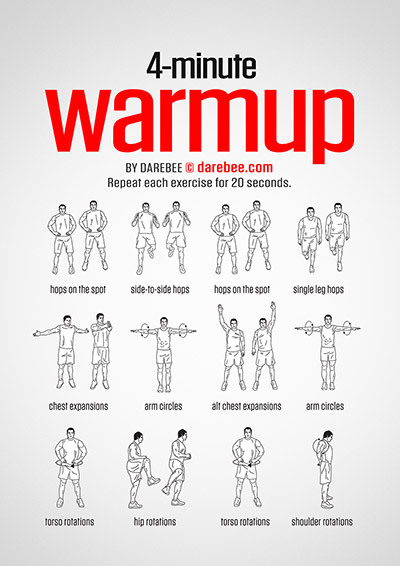 Important difference: warm-ups should always be dynamic, always use active exercises (e.g., hops, rotations, chest expansions) to get our bodies ready. We need to get the blood flowing, especially during colder seasons. Our bodies benefit from stretches after we have already worked out - our muscles are more susceptible to them allowing us to stretch further and hold the stretches longer. 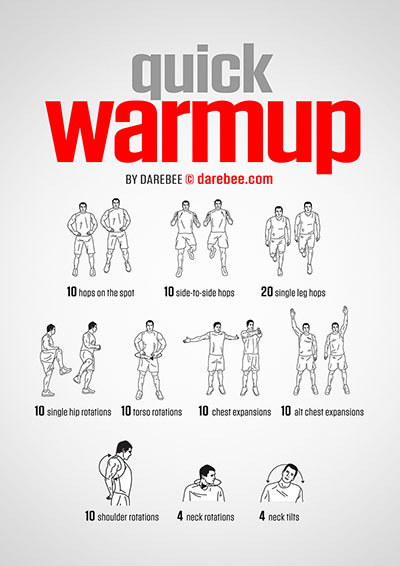 Most warmups don’t take very long, just two-three minutes, five minutes tops. 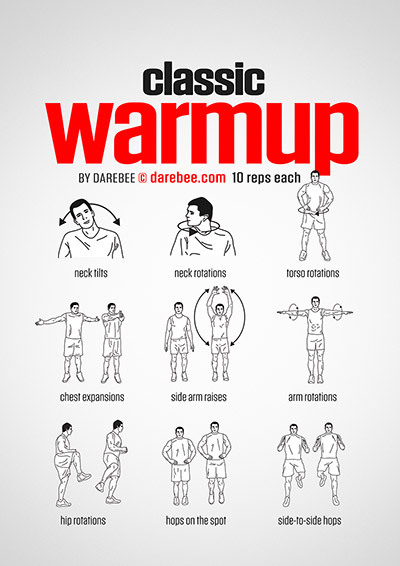 To benefit us the most a warm-up should work the same muscles we will be engaging during the main workout - they should include lighter exercises or a toned down version of the training ahead. 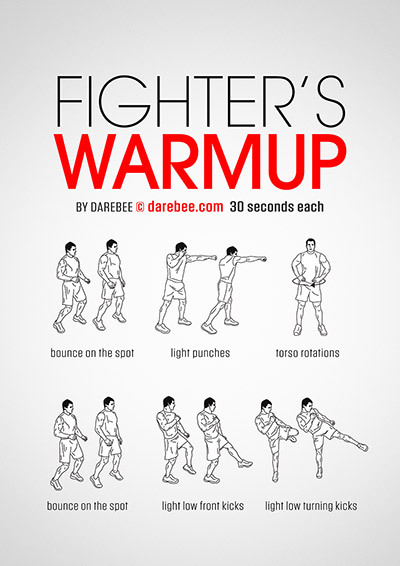 If you are doing martial arts training a warm-up should also include a few light kicks and punches. Tip: If you are short on time and you are doing a bodyweight workout, you can forgo a specific warm-up and do the first set of the circuit moving at a slower pace, jumping lower and moving slower in general turning the first set into a warm-up. The temperature of when and where you workout plays a difference. In winter our body keeps most of the blood flow away from our extremities so warming up will take longer. In summer with higher ambient temperatures, the body is already half-warmed up and our muscles are loose. Many Olympic athletes tend to ‘chase the sun’ for that reason training in Australia and California so they spend all year in a summer environment. Cool downs are a natural end to any session but it doesn’t have to be stretching at all. It can be anything from yoga to meditation to a jog or a walk. Cool-downs are designed to get us back into normal pace gradually and give us time to recover. 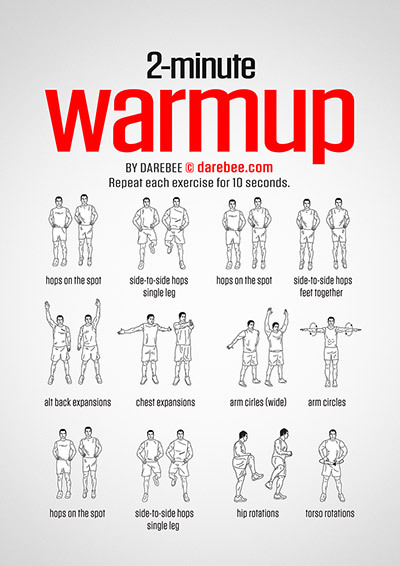 Unlike warm-ups they are not absolutely necessary but they do help. Although cool-downs don’t have to include stretching, it is the smart thing to do. You benefit the most from stretching exercises when you have already exercised for a prolonged period of time - that’s when your muscles are ready for it the most. Everyone can get flexible if they work at it. Some people have a natural gift for flexibility others have to struggle to gain every little bit but everyone can get there. It takes persistence and regular training and the muscles adapt and respond. The best time to stretch is post-workout when our muscles are completely relaxed, thoroughly warmed up and capable of giving us the most stretch, easiest. When muscles are really well warmed up they exhibit a high degree of plasticity. That means that not only do they stretch but after stretching and cooling down they maintain an increased range of movement and display greater flexibility. This is the reason why everyone should stretch: range of movement. Whether you are a boxer or a ballet dancer your sport will necessitate your muscles performing by working through a range of motion. Muscles that are tight and constricted tend to work against each other to perform the move. That means that energy which should be used in the move itself is actually soaked up by fighting against the muscles themselves and the supporting muscle groups. This leeches away power. To browse our stretching routines collection go to Workouts’ page and select the filter “Stretching”.